I spent the last few days thinking about a new program which has hit our local airways. Transylvania on TV. That is the program title, which is a part of the Romanian hour. The biggest thing thus far, is Dracula, and the Countess of the Blood. They've shown a bit of the rolling countryside, which comes right before they show a castle. All of this is elegant but since my Romanian is not the finest, I have a hard time following what it says. The commentator loves to speak of "Tepes family" which at first took me by surprise, I wondered weren't they princes of Wallachia. Turns out Transylvania was the natural hiding place for many a prince, castles and fortress, and people who could defend them. 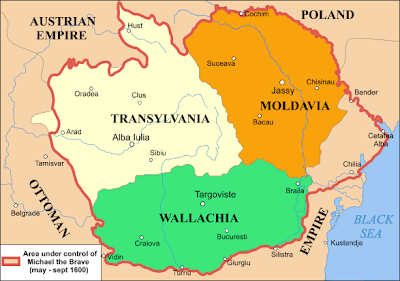 So if you were a noble prince who needed to leave Wallachia where would you go?